The Aberdeen Art Gallery was first opened in 1885, and more than a hundred years later, continues to be one of the city's most popular attractions. The gallery has a large permanent and changing collection, housed in an impressive 19th-century building with an exquisite marble interior. Highlights include collections of Modern Art, the Scottish Colourists (including artists such as Leslie Hunter and Francis Cadell), and the Post-Impressionists. The collection spans from the 15th century to the present. There is also a collection of local applied art and crafts, including fine examples of Aberdeen silver. The collection of the Aberdeen Art Gallery is extremely varied, ensuring that art lovers of all kinds should find something to delight them. The gallery also hosts a full programme of temporary exhibitions, lectures, concerts and other events, details of which can be found on the official website. 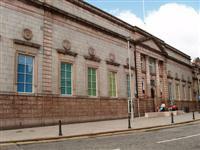 Undergoing major renovations; the Aberdeen Art Gallery is set to reopen its doors sometime during winter 2017. The upgrade to the institution will include an increase in the number of galleries, from 11 to 21, and significant improvements to social spaces with a new top-floor cafe bar and a roof terrace, where guests can enjoy magnificent views of the city.